The detrimental effects of government-mandated money – and conversely, the benefits of sound money adoption – were discussed in the previous article in this series, as were the properties that make Bitcoin a powerful and permissionless alternative to fiat. In this piece, we’ll focus on the technology that makes the protocol so robust and why that matters in today’s world. It’s wise to first provide a definition for Bitcoin, not an easy task. As a complex ensemble of components giving rise to a series of emergent behaviours and phenomena, the what of Bitcoin appears to have a lot of subjective baggage attached. Bitcoin scribe Nic Carter has tackled some epistemological and ontological perspectives of Bitcoin, as informed by wider phenomenology. From a user’s perspective, Bitcoin is a payment system that allows them to send payments without regard for borders, governments or geographical distance. Once a transaction has been included in a block, it is said to have a single confirmation. With each subsequent confirmation, it becomes harder for an adversary to reverse, alter or censor it. In times of normal network operation, a transaction is considered final and spendable once it has six confirmations – though in reality the finality is probabilistic rather than absolute. 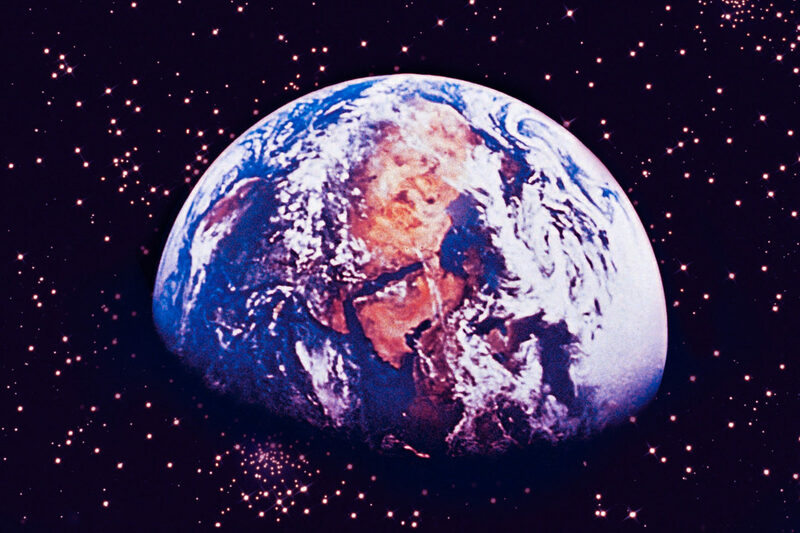 In other words, it is extremely unlikely to be reversed, rather than impossible. Though Bitcoin has not experienced large-scale reorganisations of its ledger history (so-called ‘majority’ or ‘51%’ attacks), it is becoming an increasingly common occurrence in smaller PoW networks. As a user, what could be less confidence-inspiring than the prospect of storing your precious value in a fragile network which gets disrupted relatively easy and often? It’s akin to leaving your front door ajar and wondering why things keep getting messed up. In essence, the hash function is a deterministic process which takes a piece of information (of any length) and returns a piece of information of a specific length. 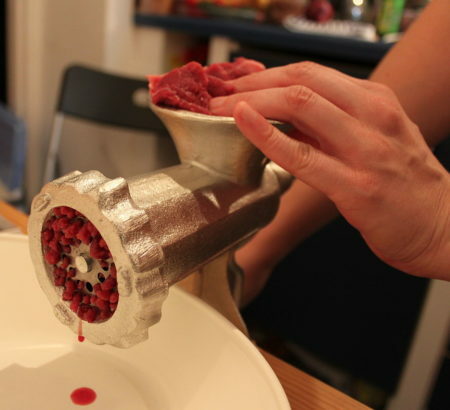 Think of such a function as a meat grinder – you can put a cut of fine Kobe beef through one to produce mince, but it is all but impossible to reverse-engineer the original. Decentralisation isn’t easily reduced to a binary phenomenon, more closely resembling an emergent, complex and multidimensional spectral characteristic. The notion was originally espoused by de Toqueville as an antonym to the centralisation of state power before and after the French Revolution. A number of approaches to characterise decentralisation as a meaningful or even quantifiable metric have been made, with varying insights and approaches. In a given network, you’ll probably want to consider a myriad of different factors such as the technology, the organisation (or lack thereof) of the participants, the data structures that host the historical record and the topology of the network itself. To all intents and purposes, Bitcoin fares quite well with all of these metrics – hashpower centralisation may be an issue, though game theory and “skin in the game” due to sunk costs in equipment outlay would in most circumstances incentivise an actor in possession of a significant amount to act honestly. An example of this was the mining pool GHash.io which breached 50% of network hashrate in 2014, before widespread commotion and redistribution of computational resource. The exodus was so pronounced that the pool ceased to exist shortly afterwards. 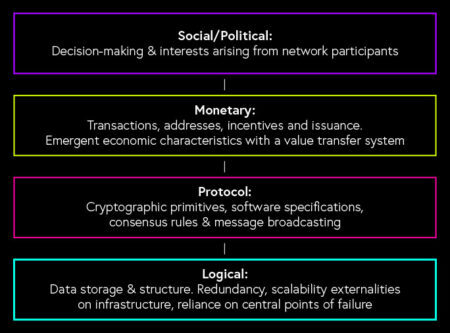 A layered stack model of cryptocurrency networks, developed from concepts outlined by Vitalik Buterin. Let’s attempt a finer grain perspective of what these concepts embody employing this layered approach. Immutability is an attribute primarily observed at the protocol layer – upon which the monetary layer depends for persistence – ensuring the inability of stakeholders or adversaries to alter the transaction record and thereby balances. Censorship-resistance is also primarily observed at the protocol layer, as valid transactions of any type are not prevented from being broadcast to the P2P network, included in blocks and recorded in the network’s shared ledger. Permissionlessness can be regarded as a related phenomenon on the social layer, where no persons or entities are prevented from broadcasting transactions and being included in the ledger, so that anyone can participate and use the network without prejudice. Decentralisation itself can be taken to mean different things when considering the various layers in our model. Protocol decentralisation would refer to distribution of nodes fully validating the ledger from it’s genesis and incentives for mining and validation of transactions and/or blocks. Monetary decentralisation can be assessed by studying inequality in the concentration of asset distribution, though this is an imperfect heuristic in cryptocurrencies as an entity may control many public keys, which in turn can generate many addresses. A more pressing issue is the quantity of bitcoin held by centralised exchanges – Coinbase alone custodied at least 5% of all BTC as of late 2018. Former Ethereum Classic development team ETCDEV’s logo. RIP. 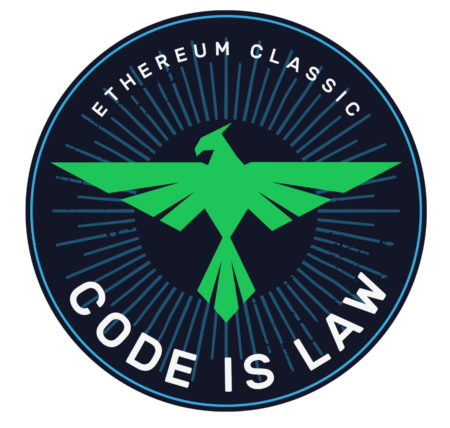 With this in mind, the oft-quoted concept of ‘code is law’ which refers to immutability in cryptocurrency networks, typically referring more to preserving the intended use and function of a system and its ledger rather than a blind adherence to a software implementation regardless of flaws or vulnerabilities. For example, a recent critical vulnerability in some versions of the “reference implementation” of Bitcoin’s software client – Bitcoin Core – would have allowed an adversary to crash mining nodes on the network and clandestinely create further supply of bitcoin UTXOs, thereby violating the supply cap. There was little resistance to fixing this as it was deemed to be an obvious software bug in clear contradiction of the implicit but mutually understood ‘rules of Bitcoin’. However a similar issue became extremely contentious in the Ethereum network in 2016 following the catastrophic failure of an investment-focused smart contract suite known as “The DAO”, leading to a network split as actions taken to delete certain balances including some “child DAOs” (that were not ascribed to the attacker) was considered a violation of the network’s immutability and the promise of “unstoppable applications”. This led to the creation of a new network keeping the Ethereum name, and a continuation of the original network’s philosophy known as Ethereum Classic, where a significant minority of the original Ethereum community continued mining, developing and maintaining the network built around the canonical blockchain. Bitcoin’s key characteristics – scarcity, decentralisation, immutability, censorship-resistance and permissionlessness – are a result of careful design and development over the past decade and represent some of the most significant achievements in computer science and engineering to date. That being said, much work remains to be done in order to realise the ultimate potential of cryptocurrency as an impenetrable guerilla financial armoury empowering the dispossessed peoples of Earth against authoritarianism and oppression. Watch this space for two more installments in this series and more on the potential of cryptocurrency to empower those living under authoritarianism. Matt B is a writer and content strategist in the cryptocurrency space with a particular interest in Bitcoin and privacy technology. He can be reached at www.itsmattbit.ch and @MattoshiN on Twitter and Medium.